Do we ask for help with things? Some of us try to go it on our own and keep the fact of our need hidden. We think it makes us look weak to ask for help. James disagrees. Read James 1:5-8. 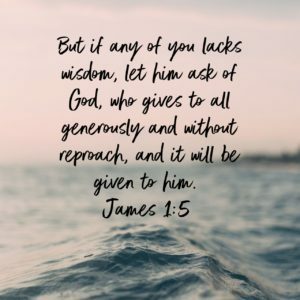 God has all wisdom. Most of us will agree that He knows more than we do. Yet, how often do we come to Him with our day to day issues? Sure, we ask for help on the “big” stuff, but what about the small things? Do we really trust that God knows more about the small stuff than we do? God will give generously. We have to ask with the right motives, but he will certainly give it. He knows that He knows more than us and He is willing to share, but we have to ask first. Will we?